The family of a 17-year-old soldier found shot dead at Deepcut barracks have made fresh claims they believe he was murdered. 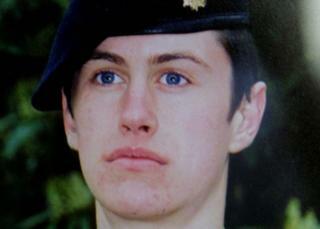 Pte Geoff Gray's mother also voiced doubts a second inquest due to begin in Surrey would bring any answers. Diane Gray said witnesses asked for by the family would not appear. Four young soldiers died at Deepcut between 1995 and 2002. Pte Gray was found with two gunshot wounds to his head in 2001. A first inquest in 2002 into the death of the soldier from Seaham, County Durham, who lived in Hackney, London, from the age of five, ended with an open verdict. A new hearing is taking place at Woking Coroner's Court after the family won the right to apply for a new hearing, arguing fresh evidence had come to light. Second inquests held into the deaths of Pte Cheryl James and Pte Sean Benton concluded they had killed themselves, after hearing evidence of bullying and a lack of care at the barracks. Mrs Gray, who has viewed material from Surrey Police disclosed to the family, said she had been left shocked by what she had been shown, but was unable to talk about it under a legal order. At a pre-inquest review last year, Judge Coroner Peter Rook QC heard the issue facing the second inquest was "simply who pulled the trigger". Mrs Gray said the family had wanted former senior Surrey Police detective Colin Sutton to give evidence after he told ITV he "felt pressured to conclude the soldier deaths were suicides". But she said: "The coroner doesn't deem it necessary." Mrs Gray added: "There is no evidence at all of Geoff being bullied. "We believe he was murdered, that somebody else killed him." Mrs Gray added that she was not looking forward to the inquest, but said: "We have no choice. We have had no choice from the very beginning. "It's something we have to do. We owe it to our son to find out how he died." The inquest, which is being held without a jury, is due to hear from 60 witnesses before final submissions are made in May. Who were the Deepcut four?